Students at Fairgrieve Elementary School collected money and supplies to support a local animal rescue organization, Paws Across Oswego County. Volunteers from the organization brought Charlotte and Sawyer, two of their most famous rescue dogs along to pick up the donated items at the school. 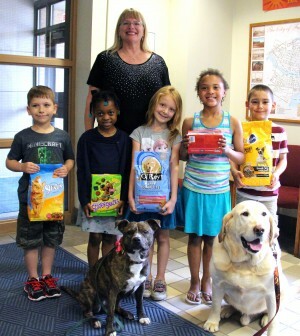 Pictured are Charlotte and Sawyer in front, with students Ayden Cusic, Jada Barnwell, Penelope Taylor, Myleigh Hayward and Luis Hall holding some of the many items collected for the organization. Along with the food, toys and supplies, a check for $2,12.00 was presented to the Marjorie Wentworth and Connie Evans, who accepted the check from Fairgrieve Elementary School Principal Jean Ciesla, pictured in back.